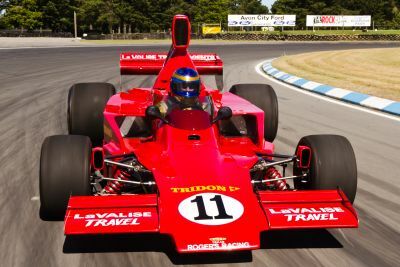 Dunedin driver Steve Ross (McRae GM1) has successfully defended his 2011/12 MSC NZ F5000 Tasman Cup Revival Series title after a hard-fought final 2012/13 round at the annual Evolution Motorsport Classic Speedfest meeting at Invercargill’s Teretonga motor racing circuit today. In a meeting which saw three different MSC class race winners – pole-setter Andrew Higgins (Lola T400) in the first, Ross in the second and eventual round winner Clark Proctor (March 73A) in the third – Ross ended the season with 649 points, 156 more than the fast-finishing Clark Proctor (493) and 225 more than third placed David Banks (Talon MR1). A serious accident involving two of the MSC series competitors (see http://www.stuff.co.nz/the-press/sport/8315304/Christchurch-motorsport-driver-in-serious-crash) on Friday afternoon was not the start that competitors in the popular New Zealand-based Tasman Cup Revival series wanted but the action on the track on Saturday and Sunday was first rate. Sunday’s 12-lap series final was a cracker, Clark Proctor taking the win from poleman Andrew Higgins and visiting Australian driver Bryan Sala (Matich A50). Higgins and fellow front row starter Proctor were neck and neck off the rolling start but as the field thundered down to the circuit’s famous Loop corner at the end of the start/finish straight Proctor was in front with third place starter Ross tucked in behind him and Higgins on the outside in third. Higgins was not prepared to lose two places though and passed Ross round the outside – in a move made famous by New Zealand Indianapolis 500 winner Scott Dixon – of the Loop, slotting Ross back to third, where the Dunedin man stayed until three laps later when he spun on oil. That allowed a fast-starting Sala to inherit third which he held to the line with Greg Thornton (McRae GM1) fourth, ahead of Paul Zazryn (Lola T332), Steve Ross who was able to re-start and get back onto the track without damage, and Michael Whatley (Surtees TS8). 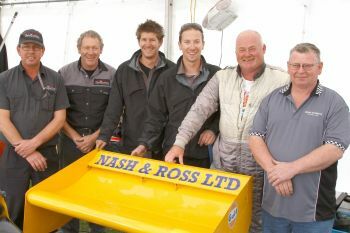 With a win in the final race and second places in the shorter eight lap races on Saturday and Sunday, it was Proctor who was the overall round winner from Andrew Higgins, Steve Ross and Greg Thornton. The latter spent the race hounding Paul Zazryn, finally finding a way past to claim fourth on the last lap. As well as winning the round, Proctor also set a new category track record on his way to second place in the second weekend race on Saturday morning, leaving it at 54.478 seconds. Proctor joined the MSC F5000 series last season after starting his competitive driving career in Speedway then moving to Targa events and the NZV8 tin-tops series and says he has thoroughly enjoyed his better-late-than-never introduction to single-seaters via the MSC series. Despite being a little frustrated that the oil flags went out after he spun Steve Ross was also very happy with the way the event – and season – panned out. For sheer pace and wheel-to-wheel action the second race of the weekend on Sunday morning would take some beating, Higgins again on pole with Ross beside him and Clark Proctor on P3. Ross got the jump on Higgins off the rolling start with Proctor tucking in behind. Higgins and Proctor then disputed second place with Higgins getting past early on but Clark returning the favour and setting the new class lap record as he kept Higgins behind. Behind the leading trio Greg Thornton drove a lonely race in fourth as Michael Whatley and Paul Zazryn spent the race disputing fifth with David Banks enjoying another strong run in seventh as he led Peter Dunn (March 73A) and Bryan Sala (Matich A50. After pipping both Ross and Proctor in qualifying in the morning Andrew Higgins won the weekend’s first MSC race from Ross and Proctor. A fast-starting Ross actually got the jump on both Higgins and Proctor off the rolling start but Higgins was back in front before the end of the first lap. As it turned out Proctor also – eventually – found a way past Ross, crossing the finish line in second place. Behind Higgins, Proctor and Ross, Michael Whatley was the first of the visiting internationals home in fourth place with compatriot Greg Thornton and Australian Paul Zazryn fifth and sixth respectively. Monaco-based Brit Peter Dunn was next home three seconds back in seventh with Bryan Sala eighth, David Banks – who recovered from a spin exiting the last corner on the last lap – ninth and former series champion Ian Clements driving fellow Christchurch man Lindsay O’Donnell’s Begg FM5 tenth, the field rounded out by series guest Phil Mauger driving the ex Denny Hulme McLaren M23 Formula 1 car and Australian Bill Hemming in his Australian-made Elfin MR8A-C.
New MSC NZ F5000 Tasman Cup Revival Series paceman Clark Proctor (March 73A) again proved the man to beat in the 12-lap NZ Express-sponsored final at the annual Skope Classic meeting in Christchurch on Sunday. It was the second win of the weekend at the 3.33km Powerbuilt Tools Raceway at Ruapuna Park circuit for the talented Auckland-based all-rounder, who claimed his debut series pole position and win at the fifth MSC series round at Auckland’s Hampton Downs circuit a week before, and who only missed out on a sixth round series clean sweep at this weekend’s penultimate 2012/13 series round when a brake line blew while he was leading the second race of the weekend earlier in the day. Defending series champion Steve Ross (McRae GM1) shadowed Proctor in the red flag-interrupted qualifying session on Saturday morning and beat a slowing Proctor to the finish line in the first race of the day on Sunday morning but the lap times told the story, Proctor quickest in all three races, including the second before he was slowed by the brake problem. After the final, however, Proctor was just as happy talking about Ross, a driver who – like fellow former series champion Ken Smith – has set the bar in the class so high. “Steve’s a good competitor, a great guy to race against and a good all round guy off the track as well. He and Kenny are the guys who have set the milestones in this class so they are the guys, when you come into the class, you aim at. Yes, the class is first and foremost about the cars but there’s still an element of competitiveness amongst the drivers and Steve is a benchmark so it is really great to compete with him at this level,” he said. In hot, dry conditions in front of a large and appreciative crowd Proctor and Ross thundered away from the rolling start at the start of the feature NZ Express final side by side but Proctor was already a couple of car lengths ahead as he and Ross accelerated away from the first corner with UK-based series regular Greg Thornton slotting his ex Stu Lush McRae GM1 into third ahead of a fast-starting Russell Greer (Lola T332), Class A standout Michael Whatley (Surtees TS8) and the first of the six-strong contingent of visiting Australian drivers, Paul Zazryn (Lola T332). That’s how the order looked like it was going to stay too, until Michael Whatley pitted to check out fluctuating oil pressure (a problem quickly traced to a cracked oil tank). That elevated Greer to fourth until he was shuffled back to sixth by Paul Zazryn and compatriot Bryan Sala (Matich A50). Behind Sala, Greer led a race-long battle for Lola supremacy initially fronted by David Abbott (Lola T430) from Sefton Gibb (Lola T332), series young gun Alan Dunkley (Lola T140) and Peter Sundberg (Lola T332 with Australian Aaron Lewis in the other Matich A50 in 11th and Talon MR1 pair Aaron Burson and David Banks disputing 12th. Initially, Proctor and Ross pulled away from Thornton but as Ross got closer their pace slowed, allowing Thornton to pull back a couple of car lengths and enjoy the dice from the best seat in the house. A little further back former New Zealand saloon car star Peter Sundberg (LOla T332) was having one of his best MSC series races to date following Sefton Gibb past David Abbott (Lola T430) mid race and eventually crossing the finish line in eight place. Behind Abbott, Talon MR1 drivers Aaron Burson and David Banks remained close and Aaron’s father Peter (McRae GM1) again got the better of Australian visitors Bill Hemming (Elfin MR8) and Rod Carroll (Lola T140) after the trio swapped places throughout the race. With another crack start and a healthy early margin on Steve Ross, Clark Proctor looked set to win the second race too, leading comfortable until slowing on the fourth lap with a long brake pedal, letting Ross close back up and a lap later find a way past. Behind Proctor, Ross and Michael Whatley the big mover was Paul Zazryn who slotted into fourth place in front of Greg Thornton and Sefton Gibb. Behind Gibb, young gun Dunkley circulated in seventh until caught and passed by a hard-charging Bryan Sala with fellow Matich driver Aaron Lewis in ninth in front of local Lola men Russell Greer, David Abbott, Peter Sundberg and Stan Redmond. By the third lap Greg Thornton had caught and passed Zazryn with Bryan Sala edging away from Gibb, Dunkley, Lewis and the battling duo of Greer and Abbott. Twice Abbott got past Greer but each time Greer was able to respond and take the positioin back. Just ahead, Sala was edging closer to Paul Zazryn, while Greg Thornton was slowly reeling in Michael Whatley. Neither quite managed to gain another position before the chequered flag came out but at the flag the gap between the two English drivers was just 0.134 of a second, the one between Zazryn and Sala just 0.168. Having lost valuable set-up time with driveline issues at the two Hampton Downs rounds Sala in particular was enjoying the opportunity to dial driver and car into the track and concentrate on his lap times. Compatriot Paul Zazryn was also proving a quick learner. “Yes, ” he said, ” I’m loving it here, having a ball. I was actually quite surprised when I got up to fourth but after a couple of laps I felt I was pretty comfortable there. After Greg went past I could see Bryan coming but by that stage it was just a matter of keeping the car straight and on the Island. Compatriot Aaron Lewis ran in ninth place until mid race when his car went off song and he slipped back down the field to 15th place. After topping the time sheets in the red flag-interrupted qualifying session on Saturday morning, Proctor won the weekend’s first MSC race later in the afternoon from Ross, Whatley and Thornton. Fellow front-row starter Ross was resolute in his pursuit Proctor, but despite closing the gap to less than a car length at the hairpin at one stage, couldn’t find a way past. 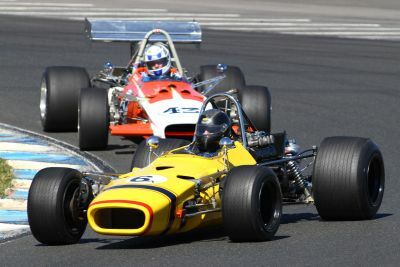 As Proctor and Ross eased away Whatley circulated quickly and cleanly in third with Thornton fourth and Sefton Gibb – making an impressive return to the series after 18 months out of his Lola T332 – fifth, Paul Zazryn and Bryan Sala vigorously disputing sixth and category young gun Alan Dunkley seventh. Behind Alan Dunkley, Russell Greer caught and passed David Abbott with Abbott leading a three car freight train consisting of Lola T332 drivers Peter Sundberg and Stan Redmond ,and Aaron Burson. Meanwhile, after missing out on qualifying as he put his car’s gearbox back together after smashing the casing on Friday Australian visitor Aaron Lewis was able to work his way from the back of the grid to 14th place by the time the chequered flag came out. 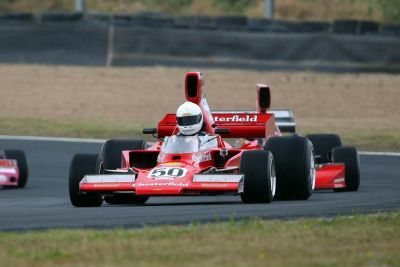 Behind Lewis, Aaron Burson’s father Peter Burson (McRae GM1) eventually got the better of visiting Australian driver Bill Hemming (Elfin MR8) to cross the finish line in 15th place with Rod Carroll, who had been able to repair damage to his Lola T140 sustained at Hampton Downs with the help of Christchurch-based F5000 specialists Motorsport Solutions LTD, 16th and compatriot John Bryant in a similar Lola T140 18th. 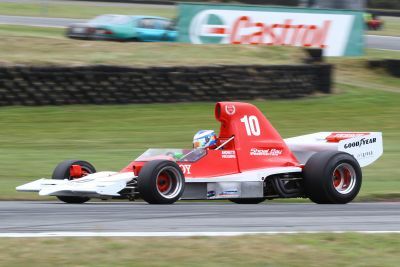 The MSC F5000 Tasman Cup Revival Series is organized and run with the support of sponsors MSC, NZ Express Transport, Bonney’s Specialized Bulk Transport, Mobil Lubricants, Pacifica, Avon Tyres and Exide. Invercargill’s Teretonga Park hosts the final round at the Classic Speedfest meeting in a fortnight’s time. 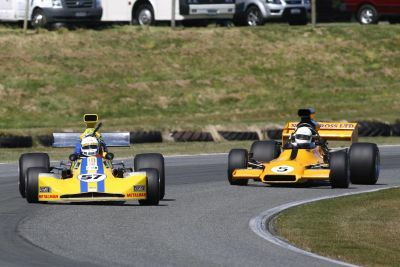 High-profile Auckland all-rounder Clark Proctor (March 73A-1) is the latest MSC NZ F5000 Tasman Cup Revival Series race winner after a popular lights-to-flag win in the feature 15-lap final at the second NZ Festival of Motor Racing – celebrating Denny Hulme at Hampton Downs today. Defending series champion and current series points leader Steve Ross (McRae GM1) beat Proctor and first NZ Festival meeting race winner Ken Smith (Lola T332) to the top spot in qualifying on Saturday and to the finish line in the eight lap preliminary races on Saturday and Sunday morning – but the afternoon’s race was a Proctor benefit from start to finish. With Proctor forcing his way into the lead through the first corner and series returnee Andrew Higgins (Lola T400) following him through the first lap of the feature looked very different to those of the two preliminaries. Ross initially held third place from Smith and visiting British drivers Greg Thornton (McRae GM1), Mark Dwyer (Lola T400) and Peter Dunn but Higgins pulled out after only three laps and Ross overcooked it heading into the first turn on the fourth lap, spinning and losing several places as he scrambled to get back onto the track. “I was trying to get past somebody and I went in a bit hot,” he explained. That gave both Proctor and Smith some breathing space as the pair eased away from Thornton, Dwyer, a recovering Ross, Brett Willis (Lola T330), Paul Zazryn (Lola T332), Peter Dunn (March 73A)and young gun Alan Dunkley in the first of the older Class A cars, a high-wing Lola T140. For the next six laps Smith was never more than two or three car lengths behind Proctor with Ross getting past Thornton but too far behind the make any real impression on the front pair. Then there was Proctor and a big gap to Smith, the ageless veteran having survived a wild ride through the gravel trap on the outside of the downhill Turn 9 after having being forced wide as he was working his way through lapped traffic. 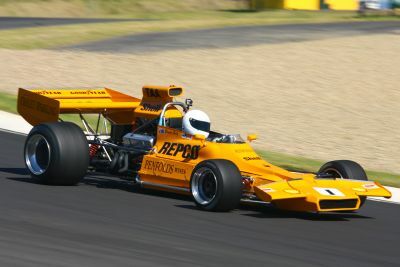 Like Ross, Smith was able to rejoin the track, in this case without losing a place, but the pressure was off Proctor and by the time the chequered flag came out he was just over eight seconds ahead of Smith with Ross third a further four seconds down the track, Thornton, Dwyer and Brett Willis making up the top six and Alan Dunkley again the first of the Class A runners home in seventh. Earlier, Australian Paul Zazryn (Lola T332) had led Monaco-based Brit Peter Dunn (March 73A), Dunkley and the Matich A50s of Australians Aaron Lewis and Bryan Sala but by race end Dunkley had found a way past both Dunn and Zazryn and Sala had worked his way Lewis and Dunn to cross the line in ninth place. Earlier in the day there was also drama in the second MSC series race of the weekend, the Safety Car deployed after Andrew Higgins spun and beached his car on the second lap then the race red flagged when visiting Australian driver Rod Carroll spun and made light contact with the pit wall at the end of the start/finish straight. Race one winner Steve Ross again got the jump on fellow front row starter Ken Smith off the rolling start with Higgins and Thornton slotting into third and fourth place respectively until Thornton was tapped into a spin exiting Turn 8 and Higgins followed suit on Turn 9. Before the race was stopped Clark Proctor held fourth from Mark Dwyer, expat Chris Lambden (McRae GM1), Paul Zazryn and Peter Dunn (March 73A-5). When the race was re-started Ross again got the jump on Smith and Dwyer with Proctor fourth, Lambden fifth, Zazryn sixth and a battle pack of Peter Dunn, Brett Willis and Australian Aaron Lewis disputing seventh. A lap later Proctor had got past Dwyer only to spin himself back down the order. That left Dwyer unchallenged in third place with Lambden fourth and Dunn fifth, until the latter slowing, however, as his car’s engine was starved for fuel. Having been able to get back onto the track after his own spin and join the grid for the re-start, Greg Thornton worked his way back up to eighth, crossing the line in front of a close-running Peter Sundberg (Lola T332), Shayne Windelburn (Lola T400) and Russell Greer (Lola T332). In 12th place when the flag came out was Clark Proctor in front of Talon man David Banks, Peter Burson (McRae GM1), Bryan Sala (forced to pit early to remove a loose muffler) and Warwick Mortimer (Surtees TS5). Andrew Higgins recovered to finish 20th, Alan Dunkley – who had to pit for repairs to his car’s nose cone – 22nd. After pipping first round race winner Ken Smith in qualifying in the morning Steve Ross got the jump on Smith and Higgins in the weekend’s first MSC series race setting the fastest race lap on his way to crossing the finish line just under a half a second ahead of Smith and just over five seconds in front of Higgins. Behind Ross, Smith and Higgins, Clark Proctor spent the race working his way back past Greg Thornton and Mark Dwyer while Paul Zazryn found himself following category young gun Alan Dunkley. Dunkley went even quicker in qualifying at this weekend’s meeting and forced his way through to seventh on the first lap. Early on he easily led Zazryn who in turn had an advantage over Brett Willis and Aaron Lewis but towards the end of the race Zazryn found a way past Dunkley to cross the line in seventh position. An early casualty was British visitor Michael Whatley (Lola T300) who pitted when he lost oil pressure. Local class stalwart Poul Christie (McLaren M10B) also pulled into the pits, but in his case it was because of his concerns with the low grip levels off the racing line on a couple of corners resealed overnight after the track surface broke up on Friday. Making history for the second weekend in a row, meanwhile, were Talon drivers David Banks and Aaron Burson. Only five Talons were made and at the moment only two are in race-ready condition – and those two are being raced at Hampton Downs this weekend. 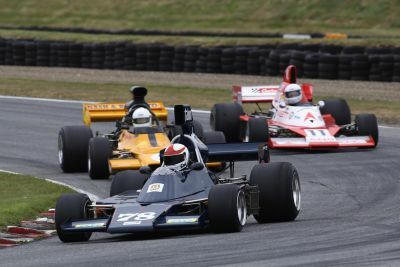 The MSC F5000 Tasman Cup Revival Series is organised and run with the support of sponsors MSC, NZ Express Transport, Bonney’s Specialized Bulk Transport, Mobil Lubricants, Pacifica, Avon Tyres and Exide. It continues next weekend at the annual Skope Classic meeting at Christchurch’s Powerbuilt Tools Raceway at Ruapuna Park. 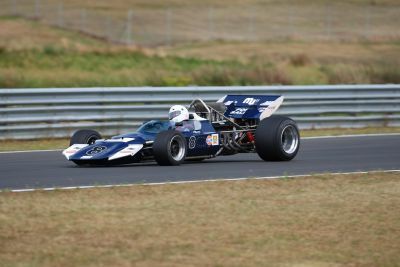 Kiwi racing great Ken Smith (Lola T332) was the toast of the large crowd at the first NZ Festival of Motor Racing – celebrating Denny Hulme meeting at Hampton Downs today, the 71-year-old in his 55th year of competition at a national level completing a winning MSC NZ F5000 Tasman Revival Series trifecta with a lights-to-flag win in the final 15-lap feature. Defending MSC series champion Steve Ross (McRae GM1) ran the wily veteran close – the margin at the chequered flag just 0.139 of a second – and fastest qualifier Clark Proctor (March 73A-1) made up time on both over the last three laps but as was the case in the other two MSC series races over the weekend Smith was in front when it counted. Smith and Proctor got the better of Ross off the rolling start but Ross had muscled his way past Proctor by the second lap and was ahead of the first of the UK visitors, Greg Thornton (McRae GM1), fast-starting Australian Paul Zazryn (Lola T332) and fellow visitors Peter Dunn (March 73A/05), Michael Whatley (Surtees TS8) and Mark Dwyer (Lola T400) when the yellow flag came out while safety workers retrieved Bill Hemming’s stranded Elfin MR8. After two laps under the yellow flag Smith got the best of the re-start with Ross and Proctor tucking in behind and easing away from Thornton, Zazryn, Whatley, Dwyer, Dunn and Brett Willis (Lola T330). As the race progressed Thornton retained a lonely fourth place, Zazryn, Wrigley and Dwyer remained close and category young gun Alan Dunkley (Lola T142) started making his presence felt. Brett Willis was also moving forward, catching and passing Dwyer and closing on Whatley. On the last lap Dunn managed to find a way past Paul Zazryn as did Alan Dunkley on Mark Dwyer. Dunkley expressed similar sentiments after his successful last lap ambush on Mark Dwyer. Veteran Michael Whatley had a similar tale to tell, despite losing fourth gear – and with it a couple of hard-won places – over the last two laps. Happy, meanwhile, just to be back on the grid at the meeting was former New Zealand saloon car ace, Peter Sundberg who joined the MSC F5000 series three years ago but did not run last season. Earlier in the day Smith won the second MSC race of the weekend after getting the better of early race leader Clark Proctor as the pair began lapping the tail-enders on the penultimate lap. At that stage of the day the track was damp with the lightest of rain showers drifting across the circuit as the race progressed. Off the rolling start the order was Proctor, Smith, Ross and Thornton but the later spun exiting Turn 7 elevating Class 2 pace-setter Michael Whatley to tuck in behind Ross and in front of Brett Willis, and Peter Dunn and category young gun Alan Dunkley to catch up. A lap later Dunkley had got by Dunn and Willis and he and Whatley quickly closed on Steve Ross. Willis stayed in front of Dunn for one more lap before spinning exited the first turn and losing two places.. While Proctor and Smith battled for the lead, Whatley and Dunkley continued to dispute fourth and fifth with Dunkley finally getting past on the fifth lap. Whatley was back in front a lap later but the pair remained close and afterwards said that the changing track conditions actually played into their hands. After Willis spun Peter Dunn inherited sixth place with Paul Zazryn seventh, Willis recovering to claim eighth, Ian Clements driving Lindsay O’Donnell’s Begg FM5 ninth and Shayne Windelburn 10th. Windelburn was on a charge though, working his way from 14th place on the grid to ninth at the flag. David Abbott had started from P9 on the grid but was a casualty of the slippery track conditions, grazing the armco exiting the downhill Turn 9 hairpin on the second lap. In the first MSC race of the weekend in fine, dry conditions on Saturday afternoon Proctor just edged an aggressive Smith out on the run through the first turn but Smith found a way past on the third lap and started pulling away from Proctor as the latter struggled with a gear selection issue. That allowed defending series champion Ross – who tucked in behind Proctor and Smith at the start – to close on then also pass Proctor and cross the finish line just under a second behind Smith with Proctor hanging on for third, Brett Willis fourth and the first of the visiting contingent of overseas drivers, Greg Thornton fifth. Early on in the eight lap race the interest behind Smith, Proctor and Ross was in the battle between fast-starting Australian visitor Paul Zazryn and Brett Willis. Zazryn made the early running but Willis wore him down and went on to cross the line in fourth place. Also impressing was Greg Thornton. After issues in qualifying which saw him start the race from P16 on the grid Thornton stormed through the field to cross the line in fifth place between Willis and Zazryn. Monaco-based compatriot Peter Dunn was the best of the Northern Hemisphere visitors in qualifying, setting the fourth quickest time in his March 73A/05, but it was actually Class A (for older cars) pace-setter Michael Whatley who got the best start and spent the early laps in sixth place ahead of Dunn and Mark Dwyer (Lola T400) Dunn eventually got past, as later on did Thornton, but Dwyer ended up slipping back down the field after losing second gear and eventually pulling in with two laps to go. 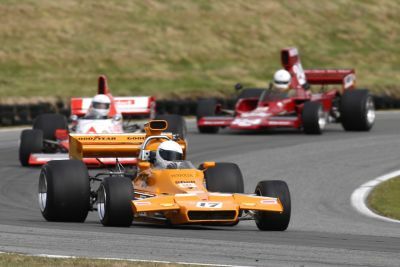 The MSC F5000 Tasman Cup Revival Series is organised and run with the support of sponsors MSC, NZ Express Transport, Bonney’s Specialized Bulk Transport, Mobil Lubricants, Pacifica, Avon Tyres and Exide. 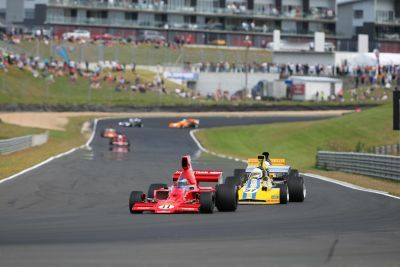 It continues at Hampton Downs at the second NZ Festivla of Motor Racing – celebrating Denny Hulme next weekend.